Before I started Banting I was in pain 24/7, had gout and a lot of medical issues that was never diagnosed. I had trouble being upright for extended periods even just standing for 10 minute was a challenge for me, my back just couldn’t take the weight anymore. I could only walk a few meters than I had to sit down for a while. I have severe psoriasis and that had a huge effect on my pain levels daily and my mood as well. I hardly slept for 4 hours a night and suffered from insomnia and I was very depressed a lot of the time. I didn’t feel like doing fun things with my kids and I hated socializing or just being around people as I was so self-conscious of my body. Getting up each morning felt like a mission both mentally and fiscally. Then I heard about it from an acquaintance was diagnosed with diabetes and he talked about Prof Noakes so I started doing some research. 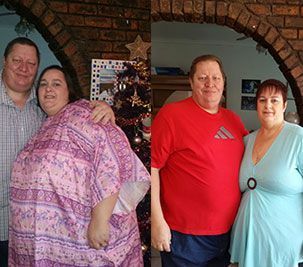 What happened next was from November 2013 I tried to convince my husband that we should try LCHF but he thought it was impossible to live without bread, rice, potatoes and pasta (as we lived on pasta etc. at the time). In May 2014 I tried talking to my husband about LCHF again as I kept on reading and the more I read the more I realized why for all my life I’ve been battling with my weight and why nothing worked. I just felt that Banting could work for me and I knew I had to do something and fast as I was feeling worse every day, I was starting to lose all hope for the future and it felt like my body can’t take any more abused with supporting all this weight. So my husband started doing his research (finally) and he was very thorough and as he has huge medical issues (Bi-ventricular heart failure) we had to make sure of all the facts. Finally he was satisfied and we as a family discussed every detail and then end of May we donate or all food stuffs and stocked up on green list items and the 1 June 2014 we started and I can honestly say we have never looked back. And now today I’m a whole 51.9 kg lighter something I though all but impossible (as a child who saw a doctor at the age of 10 because of weight issues). I can walk through a whole mall without even sitting down once and enjoying it. I don’t need to sit down while preparing the family meals. I sleep much better and I’m not depressed all the time. My psoriasis (severe) is slowly clearing up, I was diagnosed with water retention and asthma but it was both issues I suffered with before it was just not diagnosed. I’m only using my one inhaler mornings and evenings and I almost never need the other inhaler. My confidence is better and my self-image has improved. I hardly ever use painkillers anymore whereas before I used them a few times daily. My final comment on Banting is I just wish I knew all I’ve learned from the Real Meal Revolution and LCHF earlier in my life. Then I would never have put my girls, myself and my husband in the position we are. Banting has really been a saving for our family in more ways than I can mention. Both my girls (age 15 and 17) has been so successful they’ve lost 36.3 kg and 28.2 kg each and the change is their lives has just been miracles. I feel so proud of them as they read food labels and they always make the best choice where food is concerned. I will never ever go back to my old lifestyle again. I actually have hope for the future (what my health and weight is concerned) and I can picture myself in about 2 years at my ideal weight. Thanks Prof Noakes without your insight this would never have happened.